Arts on the Credit would like to introduce another new artist to you, Layal Annan. Painting hasalways been part of Layal Annan’s life. She began experimenting with different drawing techniques and later studied art and painting at a local art college, under the mentorship of several accomplished painters. In 2000, Layal decided to incorporate computer graphics into her techniques and took a one-year course at The International Academy of Design in Toronto graduating with honors. 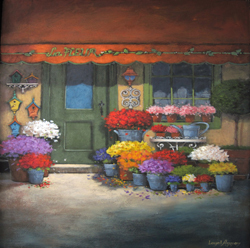 Layal’s favorite subjects are architectural detail and landscape, combined with strong colors. She has become well known for her bold, colorful painting technique. Fashion figures are also a draw for her, influenced by a great French artist called René Gruau. Through the years, she has created many posters for fashion companies and store windows. LayaI chooses her subjects from any scene that moves her, and then proceeds to put the elements in a different setting to create the mood she’s looking for. Her paintings are whimsical, in imaginary places. Layal would like people to look at her paintings and say I want to be there, or feel they are entering an imaginary world. She finds painting a way to silently communicate between the artist and the viewer, a beautiful happy world, a reflection of her when she’s painting. It is an emotional trip, Layal tries to immerse herself in the subject and moment. Every brush stroke is full of anticipation and passion for her work. Layal also teaches oil and acrylics at workshops and loves doing so. Her students constantly inspire her. Layal considers herself lucky to be a full time artist and to have the encouragement of her family. She has been living in Mississauga for over twenty years.